The main tank is a 50 gallon acrylic. 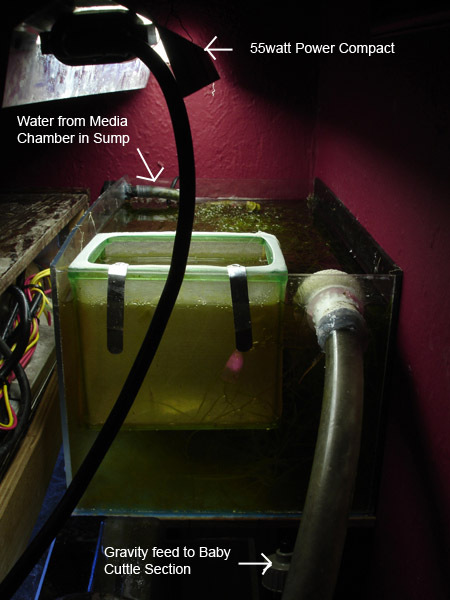 A hang on the back overflow is used to bring water directly to the Skimmer in the sump. If I ever move, I will change the tank with one that has an overflow already drilled into it. The lights are a custom setup built into the hood. 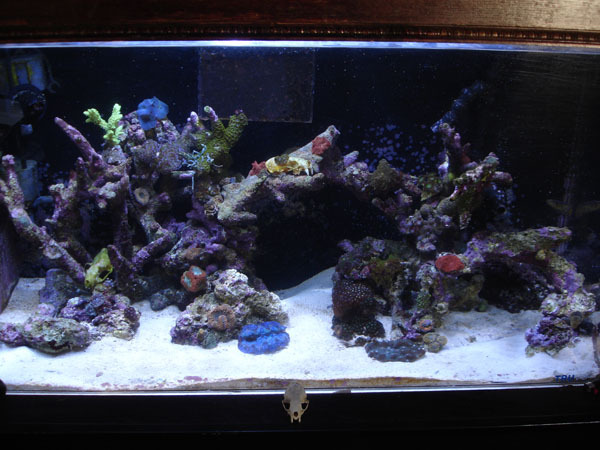 I find that a combination of a 175 watt 20k XM hallide and a 96 watt Power Compact 50/50 will give enough light to grow some corals and not be overly blinding to the cuttles. 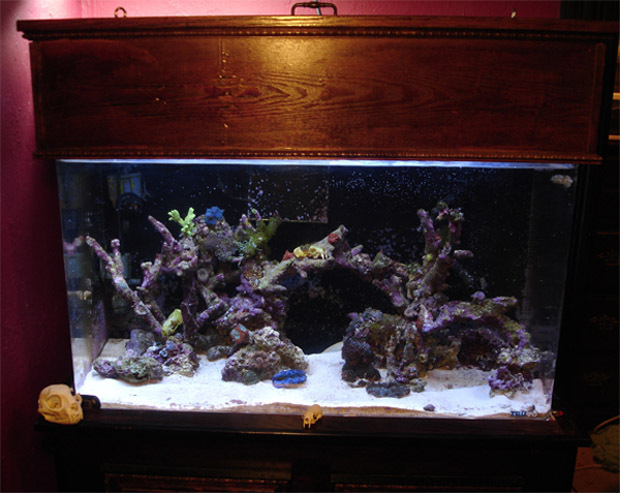 I notice that if I turn a 2nd 175 watt hallide on, the cuttles will become less active and stay in the sand. To work in the tank, the hood is made to be lifted and suspended from chains hanging from the ceiling. This way, you can work inside the tank and still see what your doing.I use a 1/2" - 1" layer of sand for aesthetic purposes only. Plus the cuttles like it. I vacuum it regularly and do not care for developing a huge amount of living diversity here. 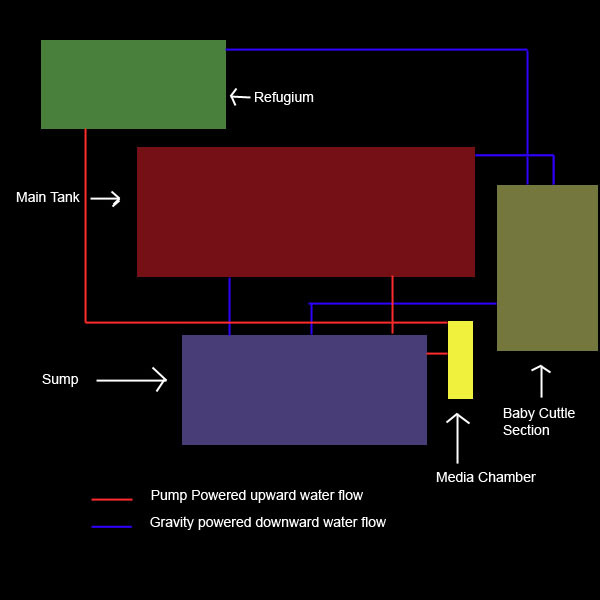 I find that having good flow and having your skimmer fed directly from the overflow is the best way to keep the tank and water clean. 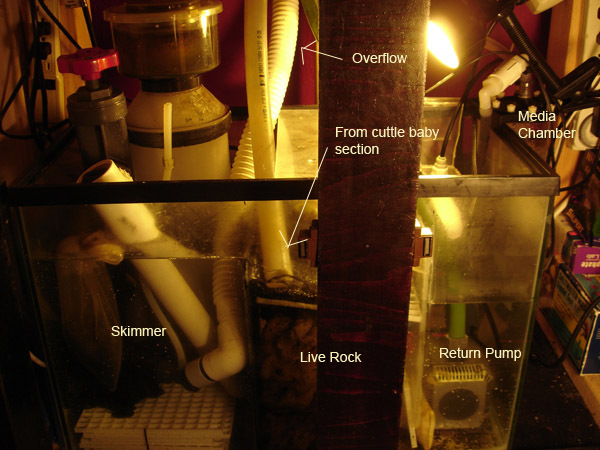 Live rock is minimised to make it easier to keep track of all the cuttles. I use a lot of branch rock for decoration which also prevents the creation of too many caves or caverns in which your cuttles can forever hide. 2 maxijet 1200s are used to increase flow. One has a spinning output to create random flow. I place high current in the back of the rocks for two reasons. One, is to keeps detritus from settling in hard to clean places and two, it prevents the cuttles from making those areas into hang out spots. Here are some images of the Left Side and Right Side of the tank. One of the most challenging parts of keeping an army of cuttlefish is to keep them fed. They are demanding eaters. I have yet to be able to get the bandensis to eat frozen foods. Also, depending on the age and size of the cuttlefish, they will require different foods. Salt water crustaceans such as shrimp and crabs are the best and fresh water animals such as guppies or ghost shrimp are considered last resort. I am often suspecting that freshwater guppies are really a bad idea from a couple mysterious deaths. A large section of my closet is dedicated to housing live foods. 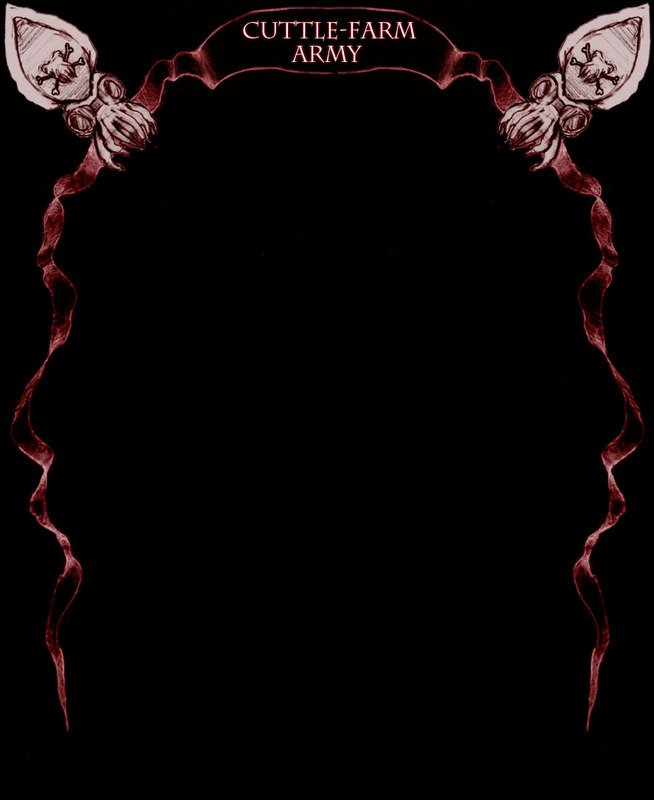 Ive made this as compact and efficient as possible. 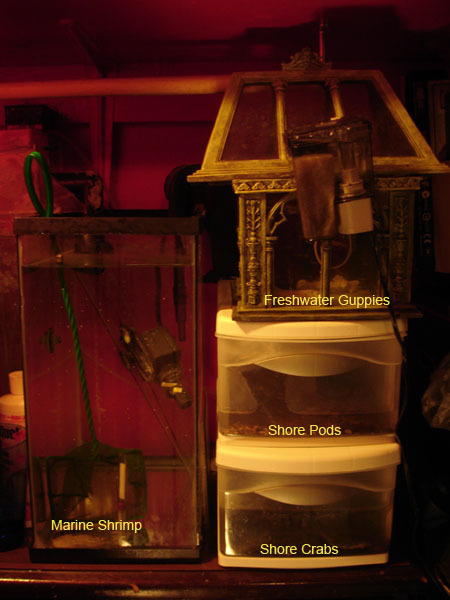 On the left is a 10 gallon tank run by a HOB skimmer and a normal HOB filter. This holds marine shrimp. However, the maximum capacity without having them all die is about 150-200 shrimps, so I also keep some in my refugium, since I order them in 250-300 amounts. On the right are stackable tupperware drawers. I keep shore caught crabs and pods in these. You will also need to limit the amount of crabs depending on how large your space is. I have a 3 inch water level and a rock in the center. I can house about 25-30 crabs here. Pods can be kept in large amounts in an inch or two volume of water. 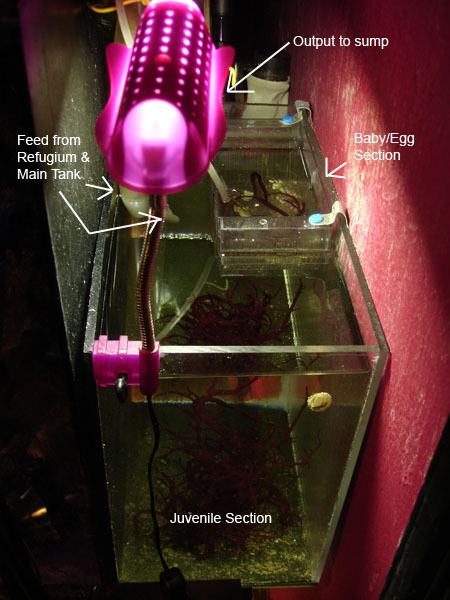 Keep a small brine shrimp net in the drawer where the net is at the surface of the water. The pods will naturally seek out dry spots and goto the net. So whenever you need pods, they will all be sitting in the net already. Here are some imgaes of the Crabs & Pods. On top of the tupperware containers is a glass container with a small HOB filter. This is freshwater and I keep guppies and ghost shrimp here.